The first in a series of Playstation remakes of classic Castlevania titles, Castlevania Chronicle is based on the Japanese X6800 PC version of Akumajo Dracula (Castlevania). As Simon Belmont, take on the undead menace of Count Dracula. 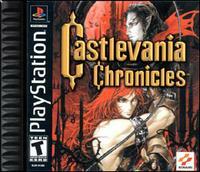 This arranged version features classic Castlevania gameplay elements, as well as enhancements like better graphics, and arranged music modes. Features artwork by Ayami Kojima (character designer for Symphony of the Night).